On Tuesday, Chattanoogans turned out in force for GIGTANK Demo Day, the concluding celebration of The Company Lab’s gig-focused summer accelerator program. With 900+ in attendance, GIGTANK Demo Day is Chattanooga’s premier technology event, serving in equal parts as an annual benchmark for how far we’ve come as a technology hub and as a launching pad for future successes. GIGTANK celebrates Chattanooga as a living laboratory for gigabit development. 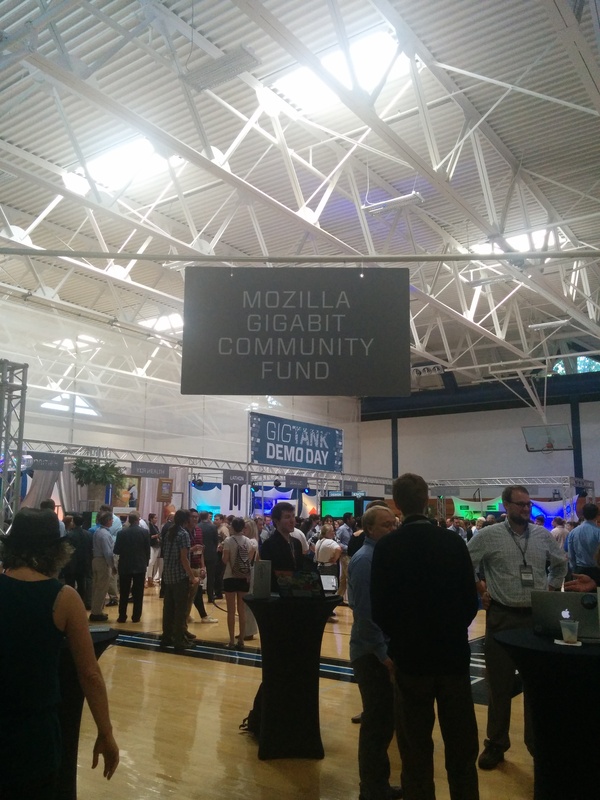 On the heels of this celebration, it seems a fitting moment to share some ways Mozilla has been supporting this unique experimentation ecosystem in Chattanooga since launching the Gigabit Community Fund and the Hive Chattanooga Learning Community last February. Consider this, if you will, a sort of “State of the Hive” report as we approach the six-month mark in the Gig City. The TL;DR? The state of our Hive is strong, and we’re growing every day as projects launch, events gain traction, and connected learning principles take root in our community. As part of our larger commitment to web literacy, Mozilla launched the Gigabit Community Fund in Chattanooga to explore how next-generation networks like EPB’s can create new opportunities to build and explore on the web in classrooms, libraries, museums and other learning spaces. Our approach to taking gig discoveries out of the lab and into the field is multi-pronged. First, we’re supporting the development and piloting of gig apps and associated curricula through the Gigabit Community Fund. Second, we’re catalyzing the adoption, spread, and scale of these innovations through the Hive Chattanooga Learning Community. And, finally, we’re leveraging the international reach of Mozilla to broadcast those successes across other Hive cities and beyond. Launched in early 2014 with support from the National Science Foundation and as part of the broader US Ignite initiative, the Gigabit Community Fund has distributed $150,000 to eight gig pilot projects in Chattanooga. In addition to this funding, Mozilla is also able to connect project participants with a network of peers, experts and potential investors, as well as to provide both national and international attention in other hub cities – New York, Chicago and San Francisco, among others – and at events like London’s yearly MozFest. Adagio | Chattanooga Music Resource Center: An audio-mixing application, piloted at the Chattanooga Public Library and Barger Academy of Art, leveraging cloud storage and remote collaboration to lower barriers to music production and education. Building an App from the Ground Up | The Creative Discovery Museum: An application-creation toolbox and digital record that will serve as a design blueprint for other youth-serving organizations in Chattanooga and beyond. devLearn | Duncan Ingram, Inc: A mobile coding application for elementary school students which recognizes that, for many across the digital divide, cell phones are a primary means of internet access, and will build critical capacity for Chattanooga’s gigabit future. GigBridge | Global Excel Tennessee: A high school student-led project bolstering English language and digital literacy skills (while improving access to health education) in underserved communities, teaching ESL students to construct interactive mobile applications focused on obesity education and prevention. The GigLab | Chattanooga Public Library: A venue for access to gigabit connected resources for the purposes of workforce development, application testing and education, the GigLab is the first public-access space of its kind. Hyperlocal Hyperaudio | Hyperaudio: A Chattanooga-centric edition of the Hyperaudio platform, creating a multimedia educational tool grounded in community history, as well as improving access to local archival history. Viditor | GeonCode: A new, online video editor being piloted in local schools, UTC-student developed Viditor is a multi-platform tool allowing students across the city to work on and edit film collaboratively. Wireless Earth Watchdogs | Chattanooga School for the Arts and Sciences: By building a student-driven, real-time water quality monitoring system using micro-controllers, the Wireless Earth Watchdogs, in collaboration with Hixson High School and the Chattanooga Public Library, are pioneering a multidisciplinary approach to digital and engineering education. Gig Demo Calls: On the first Friday of each month, Hive CHA joins forces with Hive Kansas City to host a Google Hangouts on Air call about the newest innovations in next-generation networking, software-defined networking and gig-fueled educational endeavors. Now in its third month, the Gig Demo Call has featured six unique demos from gig experts, which have reached an audience of over 250 viewers across the globe. Join us this Friday, August 1 for the next Gig Demo all at 11am Eastern! Community Coffees: On the third Thursday of the month, Hive CHA invites Chattanooga’s technologists and educators together for a caffeine-fueled discussed about integrating web literacy skills, bridging the digital divide, and connecting to Mozilla’s resources to help teach the web. Since February, more than 80 Chattanoogans have attended these coffees. Professional Development Workshops and Meetups: In collaboration with the Public Education Foundation, the Hamilton County Department of Education’s iZone, and other youth-serving organizations in our community, Hive CHA has hosted a variety of workshops and meetups focused on sharing Gigabit Fund innovations and Mozilla web literacy resources with educators and innovators. More than 300 classroom teachers and informal educators have attended these events. Maker Party: Maker Party is Mozilla’s annual campaign to spread web literacy through hands-on learning events in cities across the globe. With more than 2000 events planned for the 2014 campaign, Maker Party is another valuable platform for prototyping and sharing out innovations happening in Chattanooga and for localizing trends in education spread from other Hive communities. In July, the Hive Chattanooga team attended a Maker Party at the Bronx Library Center in New York to share the work of the Chattanooga Public Library and Gigabit Fund project Hyperaudio with the 600+ students in attendance. Now, we’re bringing this experience back home to Chattanooga through local Maker Party events. Want to explore our local Gigabit Fund projects and learn more about the state of our Hive community in person? Join us for the Chattanooga Public Library’s Maker Party this Saturday, August 2! From 12 to 3 p.m. on the 4th Floor, DEV DEV code camp graduates and educators from across the region will be on hand to help participants get started building, exploring, and creating on the web. Our partners at The Chattanooga Public Library, Creative Discovery Museum, Girls Inc. of Chattanooga, and Maker Faire Chattanooga will have awesome hands-on activities to share, and participants will leave with new web literacy skills, information about digitally-focused after school programs for the upcoming school year, and resources to keep exploring the web.